AMERICAN SODA FOUNTAIN, INC. has been in business in Chicago since 1917. 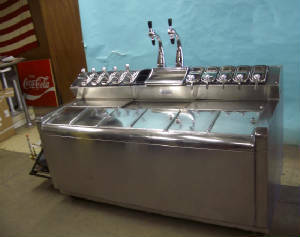 Soda Fountain & Bobtail Parts & Restoration & Service On Site or at our Warehouse. - in-house Testing / Repair & REFURBISHING in our warehouse. Your Soda Fountain ... Fountain Pumps ... Mixers ...Dispensers, etc. .. and VINTAGE & Obsolete Beverage Equipment & Soda Fountain Parts. Over the Years, we have worked with ALL the MAJOR MANUFACTURERS and CUSTOMERS to ADVANCE the these systems in COMMERCIAL & RESIDENTIAL applications. PARTS & COMPONENTS of all of the items offered. We have original manufacturer's specs on counters and mechanical details, photos. Theatres, Offices, Residential, Schools for Chicagoland Service Repairs & Installation & Sales.